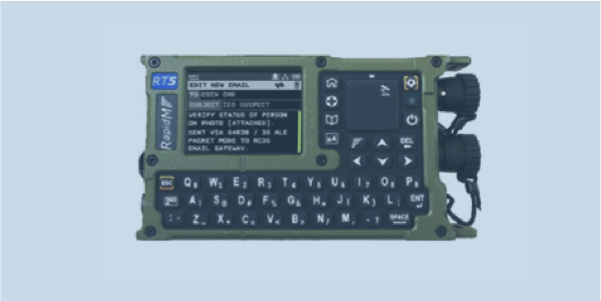 The RT5 is an ultra-rugged Tactical Terminal that works with any HF, VHF or UHF radio to provide secure voice, position and data messaging services. RT5 incorporates RAPTAWC next-generation secure digital voice (SDV) radio speech encryption using new language-independent TWELP low-rate vocoders combined with powerful AES-256 encryption, modulated for HF/VHF/UHF. Fielded RT5 units periodically send out position information, allowing other RT5 units and CommandPoint software users to track Blue Forces. RAPTAWC provides fast accurate messaging services such as: chat and QuickText, email, pictures and data files, situation reports, and SMS to GSM networks.